Open a direct line of communication with your home produce. Connect to your handcrafted beverage! App for download on smartphones with operating system Android 4.3 and higher or or iOS 7.0 and higher. EasyDens is based on the renowned oscillating U-tube principle, which is also applied in the world's most accurate density meter, DMA™ 5000 Generation M.
A.1	Which measurement parameters does EasyDens deliver? Alcohol content in percent by volume (% v/v), temperature-compensated Used for the determination of the alcohol content of binary aqueous alcohol solutions and distillates with a low extract content (e.g. spirits, gin, vodka, etc.). 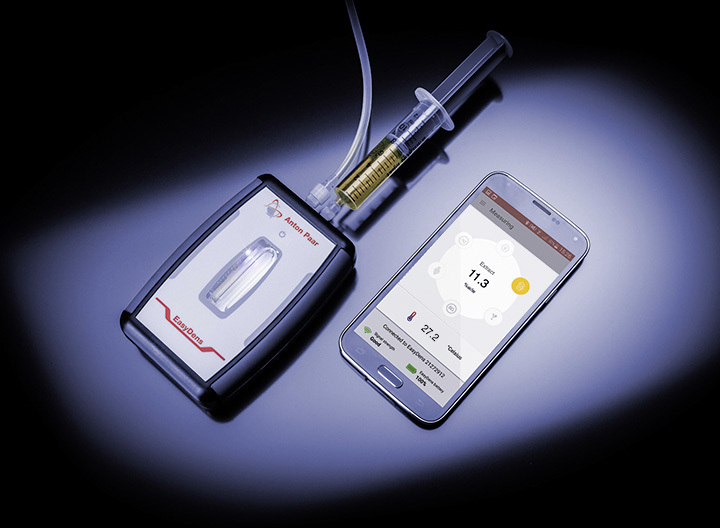 It is not possible to measure the alcohol content of beer, wine, or similar products due to their high extract content. In addition to the standard measuring parameters, you can choose one of the optionally available measuring parameters to be activated for free. The other optionally available measuring parameters can be activated via in-app purchase. A.2 What purpose do the optionally available measuring parameters serve? Alcohol content (% v/v): determination of the alcohol content in binary mixtures of ethanol and water (no added sugar); e.g. distillates, spirits, etc. Sugar content (°Brix): measurement of the sugar content in (quasi) binary mixtures of sugar and water; e.g. various fruit juices and soft drinks During wine production, a daily measurement of the apparent sugar content enables monitoring the fermentation process. A.3	What comes with my EasyDens order? A.4	Can EasyDens be officially calibrated? EasyDens has not been provided an EC type examination certificate, hence it cannot be officially calibrated. In many cases, customers will test instruments of this accuracy class on their own by checking it against an officially calibrated lab instrument or by checking it at authorized round robin tests. Please note that the missing possibility of being officially calibrated does not devalue the quality of the measuring results. Anton Paar guarantees the specified accuracy and repeatability values. B.1	Do I need to degas the sample before I fill it into the measuring cell? Yes. In order to receive correct and accurate results, the sample must be degassed before you measure it. B.2	What is the easiest way of degassing my sample? Stir the sample until no more bubbling occurs. Note that this can take up to 15 minutes. Put the sample in an ultrasonic bath for approximately 5 to 10 minutes. Fill the sample into a flask, and seal the flask with a stopper. Alternately shake the flask and lift the stopper to release the pressure until no pressure is built up anymore. Fill the supplied syringe half with your sample. Then seal the tip of the syringe with your finger and pull back the green plunger. Take your finger off the tip and let the extracted gas escape from the syringe. Push the plunger forwards to press the air out of the syringe. Repeat the specified steps several times. B.3	Do I need to filter the sample before measuring? Filtering the sample is not imperative. However, consider that large particles (> 1 mm) can clog the inlet and the outlet of EasyDens. If your sample contains such large particles, filter it through a customary coffee filter. With follow-up measurements of samples from the same batch (e.g. fermentation curve measurements), remember to always subject all these samples to the same treatment. B.4	What else to consider when preparing samples? Remember to always subject all samples from the same batch to the same preparatory treatment. This is the only way to obtain comparable measuring results and to rule out possible impairment of your measuring results because of different sample preparation. Therefore, always use the same procedure to degas and filter your sample. C.1	After switching EasyDens on, I can hear a high-pitched whistle. Is my instrument defective? EasyDens operates on the basis of the oscillating U-tube method allowing to draw conclusions on the density of a liquid from the difference between oscillations with air and oscillations with the filled sample. For this reason, after power-on the measuring cell is electronically excited to vibrate at its characteristic frequency. The high frequency oscillation is audible for the human ear as a high-pitched tone. This is not a shortcoming but an indication that the instrument is operational. C.2	How large is the required sample volume? You need around 2 mL of your sample to fill the measuring cell and perform a proper measurement. In order to fully replace sample residues from a preceding measurement, we recommend filling 10 mL for follow-up measurements. This amount matches the volume of the supplied syringe. C.3	What temperature must the sample have to be fit for measurement? The temperature of the filled sample or the cleaning liquid must be in the range 0 to 80 °C (32 to 176 °F). If you fill liquids with higher temperatures, plastic parts might soften and connections become leaky. Consider also that the automatic temperature compensation only works for sample temperatures in the range 5 to 30 °C (41 to 86 °F). C.4	Are the displayed values temperature-compensated? Concentration values that are calculated from the measured density (e.g. °Brix, % v/v alcohol, % w/w extract – these values will be available with upcoming v1.1) are automatically temperature-compensated to 20 °C (68 °F). Density values (g/cm3, kg/m3) are not temperature-compensated. For the calculation of SG (Specific Gravity), the sample's density value, compensated to 20 °C, is divided by the density of water at 20 °C. A temperature coefficient of 0.0003 g/cm3/K is applied in the temperature compensation of the sample's density value. This coefficient is typical for aqueous solutions. C.5	For which temperature range does the automatic temperature compensation work? 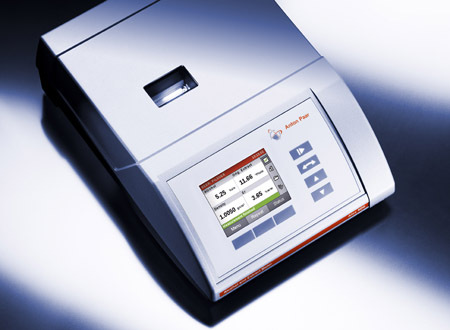 The automatic temperature compensation works for sample temperatures in the range 5 to 30 °C (41 to 86 °F). C.6	Can I use EasyDens without the protection cover? Yes. EasyDens can also be used without its protection cover. However, consider that only when the protection cover is mounted, you can be sure that the instrument is sufficiently protected against spilled liquids, particularly during filling. Moreover, the protection cover facilitates to use the instrument in an upright position. With the instrument standing upright, residual gas in the sample can rise to the upper part of the measuring cell. This reduces the risk of distorted results. C.7	Is it possible to measure with the instrument in a horizontal position? Yes. Measurements can also be performed with the instrument in a horizontal position. However, in order to minimize the influence of potential residual gas in the sample, which can cause distorted results, we recommend performing measurements only with the instrument in an upright position. With the instrument standing upright, residual gas in the sample can rise to the upper part of the measuring cell. This reduces the risk of distorted results. C.8	What to do after having finished my measurements? We recommend rinsing the measuring cell after measurements with at least 10 mL of warm distilled or deionized water to prevent contamination or deposits. After rinsing the measuring cell with distilled or deionized water, it is not necessary to dry the cell because the water will evaporate without residues. For details about cleaning, refer to section D.
C.9	Do I have to discard the sample after measuring? Yes. Discard your sample after having finished the measurement, do not return the sample into the original container. In doing so, you avoid the risk of contamination. 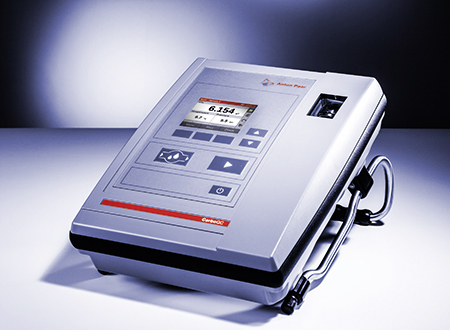 C.10	Is it possible to perform continuous flow measurements by conveying the sample through EasyDens with a peristaltic pump? C.11	How much pressure can the instrument withstand? The measuring cell of EasyDens will withstand a pressure of around 10 bar. A pressure that high cannot be reached by proper filling with a syringe. D.1	Do I have to clean and dry the instrument after each measurement? No. It is not necessary to clean and dry the measuring cell between single measurements. Sample residues in the measuring cell will be fully replaced by the subsequent sample. EasyDens comes with a 10 mL syringe. We recommend using a syringe of this size because 10 mL are sufficient to fully replace the previous sample and fill the measuring cell with the new sample. Even if the measuring cell has been filled with water, 10 mL of the new sample are sufficient to prevent a dilution of your sample. So you do not risk producing wrong measuring results due to the mixing of the current sample with the previous one or with water in the measuring cell. D.2	How do I clean the instrument after having finished a series of measurements? After you have finished a measurement series, rinse the measuring cell with warm distilled or deionized water. To this end, fill the supplied syringe with warm distilled or deionized water, and rinse it through the measuring cell and the waste hose. After rinsing the measuring cell with distilled or deionized water, it is not necessary to dry the cell because the water will evaporate without residues. In addition, clean the measuring cell once a week with a suitable laboratory cleaner (e.g. Mucasol®). Attend to the product's application instruction with special regard to the concentration of the cleaner. Follow the directions in the EasyDens instruction manual. D.3	I do not use the instrument on a regular basis. Is there a risk of mold forming in the measuring cell during storage of the instrument? If you do not use the instrument for a longer period, it is advisable to sanitize the measuring cell with high-proof ethanol after rinsing it with warm distilled or deionized water. D.4	There is a coating in the measuring cell that cannot be removed by distilled or deionized water. How shall I proceed? If visible deposits have formed inside the measuring cell, or if test measurements of your instrument with distilled or deionized water show inadmissible deviations from the target values, we recommend cleaning the measuring cell with a suitable laboratory cleaner (e.g. Mucasol®). Attend to the product's application instruction with special regard to the concentration of the cleaner. Follow the directions in the EasyDens instruction manual. D.5	Do I need to heat up the distilled or deionized water for cleaning? In particular after the measurement of wort samples, it is advantageous to clean the measuring cell with warm water because it considerably facilitates the removal of sample residues. We suggest, in this case, first cleaning the measuring cell with warm tap water and subsequently rinsing with warm distilled or deionized water. Take care that no residues of tap water stay in the measuring cell as this leads to the formation of limescale eventually causing distorted results. D.6	Where can I get distilled or deionized water and a laboratory cleaner? You will get distilled or deionized water at any DIY (do-it-yourself) store, drugstore, or gas station / filling station. Suitable laboratory cleaners are available at any shop for laboratory supplies and at brew shops. D.7	Is distilled or deionized water from the DIY store/from the gas station adequate for cleaning and adjusting the instrument? In principle, the quality of water from the DIY store / from the gas station is sufficient as long as the water has been actually and explicitly distilled or deionized. E.1	Which smartphones and tablets are compatible with EasyDens? EasyDens is compatible with any smartphone and tablet that features a Bluetooth LE interface (also known as Bluetooth Low Energy, BLE, Bluetooth Smart, or Bluetooth Smart Ready). In addition, the operating system on the device needs to be either Android 4.3 or higher, or iOS version 7.0 or higher. E.2	Do I need an active internet connection while I use the EasyDens app? The EasyDens app does not require an active internet connection for its ordinary use as a control application of EasyDens. Mind, however, that downloading the app from the Google Play Store or from the Apple App Store does require an active internet connection. E.3	How do I connect my mobile device with EasyDens? From the Google Play Store or the Apple App Store, download the Anton Paar EasyDens app free of charge onto your smartphone or tablet. Activate the Bluetooth function on your smartphone or tablet. Switch EasyDens on by pressing the on/off button once. Start the EasyDens app on your smartphone or tablet. Your smartphone or tablet will automatically establish a connection with EasyDens. E.4 My smartphone/tablet does not recognize EasyDens, and no connection is built up. How shall I proceed? Check the specifications of your smartphone or tablet to verify that the basic requirements for a communication with EasyDens are met (see question E.1). If the connection between your device and the switched on EasyDens is not established automatically when you start the app with the Bluetooth function activated, go back to the start screen of the app and tap the "Measure" button once again. Your smartphone or tablet will restart the search for EasyDens. If there is still no connection being established, check the Bluetooth visibility settings on your smartphone or tablet. Ensure that your device is visible for other devices, and that it allows establishing a connection to them. For a proper connection to Bluetooth LE devices, the approximate location of your smartphone is required. Check the location setting on your smartphone and ensure that it is not turned off completely (battery saving mode is fine). If all of the above steps fail to connect your device with EasyDens, we kindly ask you to forward a log file to Anton Paar via email using the feedback function of the EasyDens app. Anton Paar staff will contact you as quickly as possible. F.1	How do I check that EasyDens is operational? You can tell that EasyDens is ready for operation by a blue blinking LED. In addition, a high-pitched tone, caused by the high-frequency oscillation of the measuring cell, is clearly audible. As soon as a connection to the smartphone/tablet has been established, the LED will change from blinking to continuous light. F.2	Do I have to check EasyDens regularly? We recommend performing check measurements with distilled or deionized water at regular intervals. F.3	How do I check whether EasyDens delivers correct measurement values? Compare the density values which your instrument delivers for distilled or deionized water with the correct values (at the respective temperature). You will find the correct values in appendix B of the EasyDens instruction manual. There, you will also find a detailed explanation of check measurements and the necessary steps. F.4	There is a small black spot on my measuring cell. What’s that? This small black spot at the turn of the measuring cell is the NTC temperature sensor. As the density of a liquid is highly depending on its temperature, the temperature sensor of EasyDens has been fitted directly at the measuring cell in order to ensure an accurate temperature compensation. G.1	Where can I get consumables for EasyDens? Order consumables for EasyDens at Anton Paar’s online shop: shop.anton-paar.com. G.2	The FAQs were not able to solve my issue. How do I contact Anton Paar? If the FAQs were not able to solve your issue, we kindly ask you to visit www.anton-paar.com and get in touch with us via the live chat function. G.3 How can I suggest new features for Anton Paar apps? We are constantly working on improving our apps in order to give you the best brewing experience. If you have an idea for a feature you would like to see, please feel free to contact us at easydens[at]anton-paar.com. H.1 What is the U-Brew app? The U-Brew app is tailor-made for home brewers. It shows measurement results in %w/w extract or SG relative density and contains special functions for brewing. H.2 I have the EasyDens app installed on my phone. Can I use the U-Brew app as well? Yes, you can. Both apps, EasyDens and U-Brew, can be installed on your phone and connected to your EasyDens device. Be aware that only one app can be connected to the device at a time. H.3 Can I transfer my measured data from the EasyDens app to U-Brew? U-Brew has an entirely different approach when it comes to measuring data. The measured values are processed and further calculated. Therefore, as for now, it is not possible to transfer data from the EasyDens app to U-Brew or vice versa. H.4 Can I use the EasyDens app and U-Brew simultaneously? EasyDens only connects to one app at a time. You can use both apps but not at the same time.